Ryobi P102 vs P107 Lithium Batteries: Which One’s Best? If you’re invested in Ryobi’s One+ tool line, chances are that you’ve run across the P102 or P107 before. They’re two of the most common batteries used to power those tools. There’s a good reason for that. Both are lithium-ion batteries that can hold charges for a long time, which for a system as expansive as One+, that means doing a lot of work before recharge. The P107 is an advanced version of the P102, with a fuel gauge and a design for cold weather operation. The P102 is cheaper. If you are looking for no-frills power, the P102 remains a great option for you. If you want a little more and are willing to pay for it, probably the P107 is the battery for you. 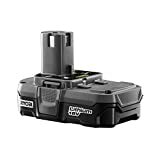 Rated at 1.5 ah over the P102’s 1.3 ah, the P107 can run for slightly longer periods of time, delivering the same 18 volts of power to more than 100 tools. In really cold weather, however, the P107’s design helps it hold its charge for longer. It also has a battery charge indicator to let you know how much longer before you’ll need to swap out batteries. This isn’t an expression of relative value, but simply raw sticker price. Sometimes it’s a good idea to look at the price in terms of value. In this case, it’s perfectly reasonable that someone invested in the Ryobi One+ tool system would want the cheaper battery. That would be the P102. The P107 gets its edge from the fact that it is designed to operate better in cold weather. This is a significant improvement over older lithium-ion batteries, which would lose their charge quickly once the mercury dropped. In terms of design, the P107 again gets the nod because it is designed to work in cold weather. If you live in a cold climate, it’s hard to oversell this point. Previous generations of lithium-ion batteries would practically lose their charge from sitting outside faster than by use. Correcting that is a major step forward in the design of lithium-ion batteries. A step up from nickel-cadmium batteries, Ryobi’s P102 is a very basic lithium-ion battery, capable of holding a charge a lot longer than predecessor batteries. Prices for lithium-ion batteries have dropped in recent years, making this more affordable. It doesn’t have a fuel gauge and doesn’t like cold weather, however. An updated version of the P102, the P107 is designed to hold its charge longer in cold weather and comes with a battery charge indicator to let you know where it stands on fuel. It also, unsurprisingly, costs a little more. Both of these batteries are great products. 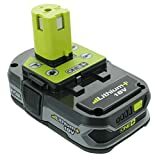 They hold their charges much longer than old-style nickel-cadmium batteries and are compatible with the more than 100 products in Ryobi’s One+ line of tools. You can’t go wrong with either of them. If your money is tight, and if you’ve just spent a bunch of it on tools from the Ryobi One+ system we can understand why then you might want to go with the stripped-down P102. It doesn’t come with a lot of bells and whistles, but it’ll get the job done. If you have extra and especially if you live in a really cold part of the country, you might want to look at spending extra. It’s design lets it keep its charge in cold weather, and it has a battery indicator light to let you know when it’s running low on juice.